Barcelona is an ideal city to go shopping in. It has 21 shopping hubs, 30 food and 3 non food markets, 9 shopping centres and 32.000 shops spread round its 10 districts. It is surprising how many Modernista establishments there are that are still in perfect condition, and many more that hide surprises: the unique character of the buildings that house them, for example, or the history revealed by the shop counters. Barcelona is an excellent city for shopping. When consumers think of luxury shops in New York, they head for Fifth Avenue. The nearest there is to that in the Catalan capital is Passeig de Gràcia. Dolce & Gabbana, Valentino and Gucci all have boutiques on this avenue. Among Spanish and Catalan designers, fashion brands such as Custo Barcelona, Josep Font and Toni Miró stand out, along with the Tous jewellery chain, popular around the world for their bear-shaped designs. There also are department stores that are easy to spot and where you can find practically everything. El Corte Inglés is one of the most popular. Shopping centres can be found right across the city and one of the newest, Les Arenes, is housed in a renovated bullring. Barcelona's local commerce model has boosted the development of shopping hubs, based around municipal markets in the city's neighbourhoods. Some of the retail establishments have a long history behind them and still preserve the original beauty of their Modernista style, despite a century of business activity. Anyone who loves good wine and exquisite delis will also find lots of shops in Barcelona that specialise in gourmet food. And there are plenty of places selling the craft products from various sectors and popular trades in Catalonia: pottery, baskets made from hazel twigs, wool, leather, wood and so on. Barcelona is Catalonia's capital and its shopping capital too, with all kinds of shops selling anything you can imagine. In 1999 the local tourist board, Turisme de Barcelona, set up the Barcelona Shopping Line office to promote the city internationally as a shopping destination. This includes a 5 km network of the most emblematic shopping streets. Among Barcelona's small and medium-sized shops an important role is played by the centennial establishments, some of which preserve their Modernista decor. They can be found in every district and are deeply rooted in their neighbourhoods. They have seen history flow past and different generations have passed through them. Traditional earthenware pottery, leather accessories, designer jewellery in various materials, glass and wrought iron, paintings, sculptures and the list goes on. 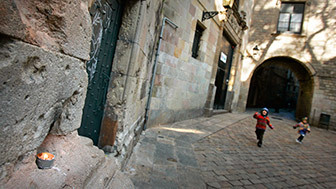 Handmade products in all their varieties can be found in little shops, especially in Ciutat Vella and Gràcia. They stock lots of Modernista-inspired designs, architectural reproductions and gift books.